Pragmatic language disorders impairs one’s understanding of the pragmatic aspects of language or one’s ability to understand what is being said and how it is situationally appropriate social situations. The https://www.asha.org states the general belief is this disorder only occurs in children with Autism, however it can also occur with an NVLD too. Having NVLD, I know how real it can be. According to Understood.org, one of the identifying signs of this disorder is a child does not understand how to respond appropriately in social situations. This leads to multiple misunderstandings by classmates or peers which may lead to a child being labeled as disrespectful. In order to remedy this a child needs is instruction in appropriate use of social communication. In my personal experience, it has always been so tricky to start a conversation and end a conversation. As a result I was labeled for being too shy or or talking too much. Group Speech Therapy is often the first treatment given the nature of the disorder. At first your therapist will have the conversation lessons focus on day to day topics to help build interest. Students then work on taking turns, maintaining eye contact and concentrating on tone of voice, asking appropriate questions, and knowing how and when to join in the conversations. Later therapy will focus on how to join in activities and participate in classroom discussions more effectively. Yes, it’s hard, but you eventually understand why the extra instruction was needed. Personally, I realized in adulthood it was the impact of my middle and high school speech therapist that helped me became a more effective communicator in all aspects of life because of her wonderful care and big heart. For me personally having this disorder made it challenging to handle social situations in a non-structured setting. For example, at lunch I would say too much or be too quiet, never quite getting it right. However, in structured settings my social skills were more up to par so there weren’t intense issues. It was still clear however ,that I needed specialized instruction to overcome this deficit as I was transitioning to middle school. 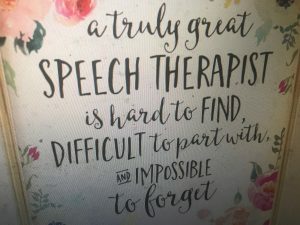 This was hard to accept as for me it meant an increase of speech therapy though my speech therapist was exceptional so I maintained a strong desire to overcome these deficits. Later on I received support from my counselor which was a tremendous resource too as I gained more confidence in my interpersonal communication through our meetings. Truly both my speech therapist and my counselor played a tremendous role in my overcoming the disorder. While it is hard to understand why those with a NVLD may have a Pragmatic Language disorder too I do know gaining the proper skills in this area can happen. It starts by always maintaining a “never give up attitude.” Yes this seems hard though overcoming the disorder is possible when you use every support offered to you effectively. I have a lot wonderful people in my life however a person who holds a special place in my heart is my middle and high school speech therapist. She was always incredible to me and never lost faith me in me no matter how hard I got.